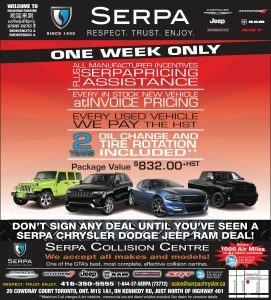 Serpa Collision Centre > Uncategorized > News > Serpa Chrysler Dodge Jeep RAM Alert: Invoice Pricing extended to end of the year! Serpa Chrysler Dodge Jeep RAM Alert: Invoice Pricing extended to end of the year! Dealer invoice pricing — one of the best Serpa Chrysler Dodge Jeep Ram special promotions ever — has now been extended to the end of the year! It includes every new vehicle in inventory—with no restrictions. And not only that, the pricing includes ALL manufacturers incentives and Serpa pricing assistance. Oh yes, and one more thing: with new vehicles, oil changes and tire rotation are included for two years. And we also have something terrific for those selecting from our impressive inventory of pre-owned Chrysler, Dodge, Jeep and RAM models: we pick up the HST. So dear friends, come and see us. This type of event will not come again, and we want you to be able to take advantage of it.